I’m feeling increasingly normal again, so I’ve been coming out of my drug-induced haze and getting some things done that I slacked on while I was recovering. One of those things was making good on P’s drunken promise to a certain friend of mine that we’d be gifting her a jar of pickles for her birthday. Don’t think I’m complaining about this. I actually love that my friends want canned food for gifts and am more than happy to oblige. 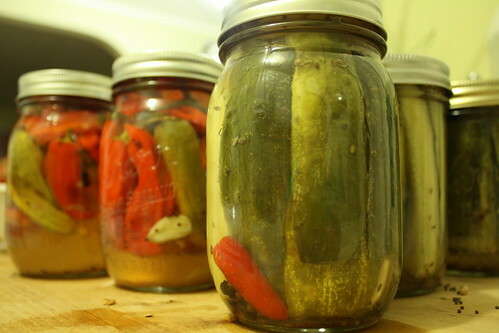 When I make pickles I generally follow a recipe for the brine ratios (salt, water, vinegar), and then improvise on the spices–tossing whatever looks good into a jar. 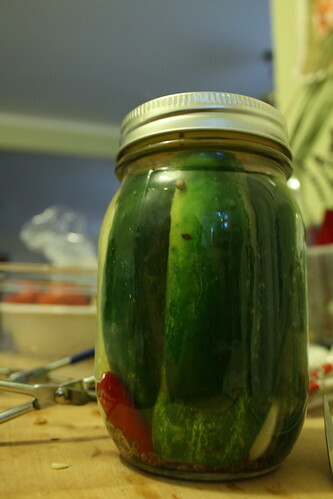 This time I roughly followed the recipe for Garlic Dill Pickles from Food in Jars. I don’t have chili flakes, so I added a whole chili to the jar. I also did a few more jars of peppers.. 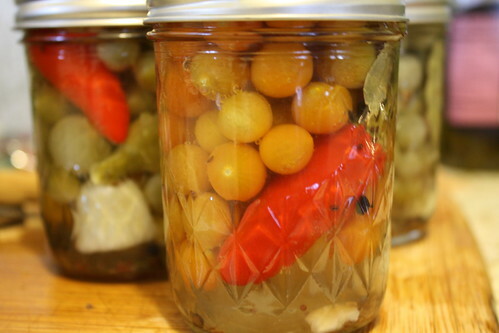 Trying to find more things to do with my exploding tomato population, today I pickled green cherry tomatoes. Following the brine recipe here, and the spice concept from here, I processed six half-pints. 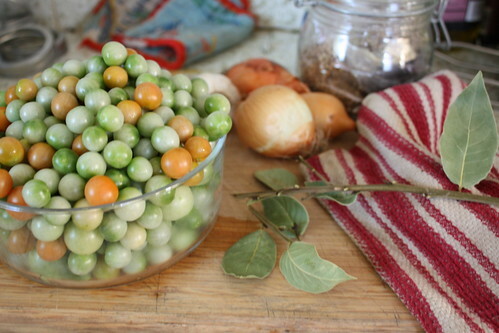 While I was picking them, I thought it would look nice to have the colors slightly mixed, with some just barely ripe tomatoes in the mix. Apparently that’s a no-no, as they won’t last as long before mushing, so everything with some color went in a separate jar to be eaten sooner. While I didn’t follow an exact recipe for the spices, each jar had one clove of garlic, a chunk of onion, a bay leaf, and then a pinch of black peppercorns, coriander, dill seed, and mustard seed. Half the jars got peppers in them. I’m pretty excited that, except for the spices and vinegar, everything in these jars is either from my garden or farmer’s market (including the bay leaves, grown by a neighbor). I’m planning on using at least some of these as martini olive substitutes. Since I have no idea how they’ll taste, I’ll report back on any other uses. It’s not too late! They are super easy. Like easier than anything else I can. Plus, I don’t worry so much about they spoiling since they are sitting in vinegar. I like the wiggle room in case i’m not 100% sterile.